When I was little, my mom used to give me half an avocado as a snack. Usually it was filled with minced garlic, lemon juice, and olive oil. Ever since then, it’s been a favorite of mine. Avocados are pretty versatile and taste good with many different flavors, so I did a bit of experimenting. The lemon and oil and balsamic and oil toppings are nothing revolutionary, but I wanted to share those since you may not have tried them. The other two are a bit different, and I think they’re delicious. The one with Greek yogurt is basically a quick tzatziki. I love my kalamata olives, but feel free to omit them if they’re not to your liking. The fourth one has a sweet and salty Asian-style dressing and is equally delcious. What do you top your avocados with? 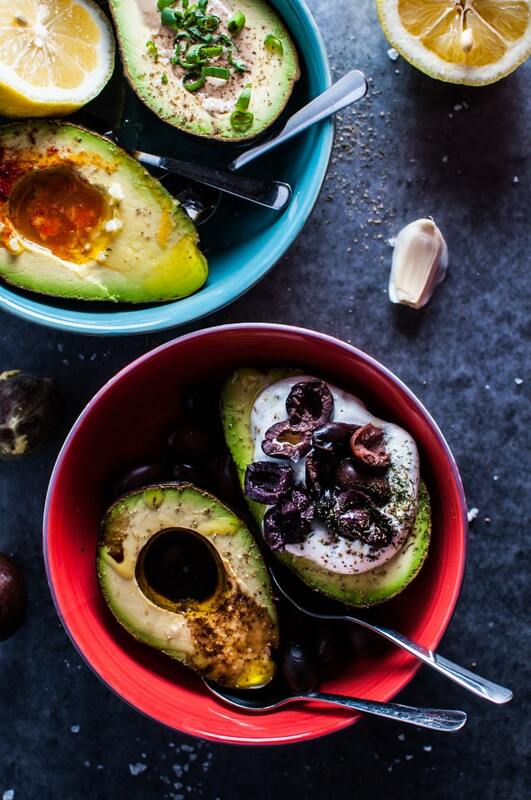 Four fast ways to top avocados! Squeeze lemon juice into avocado half (I do less than 1/2 a lemon), and then top with olive oil (approx. double the quantity of lemon juice). Add a pinch of smoked paprika and salt and pepper, to taste. 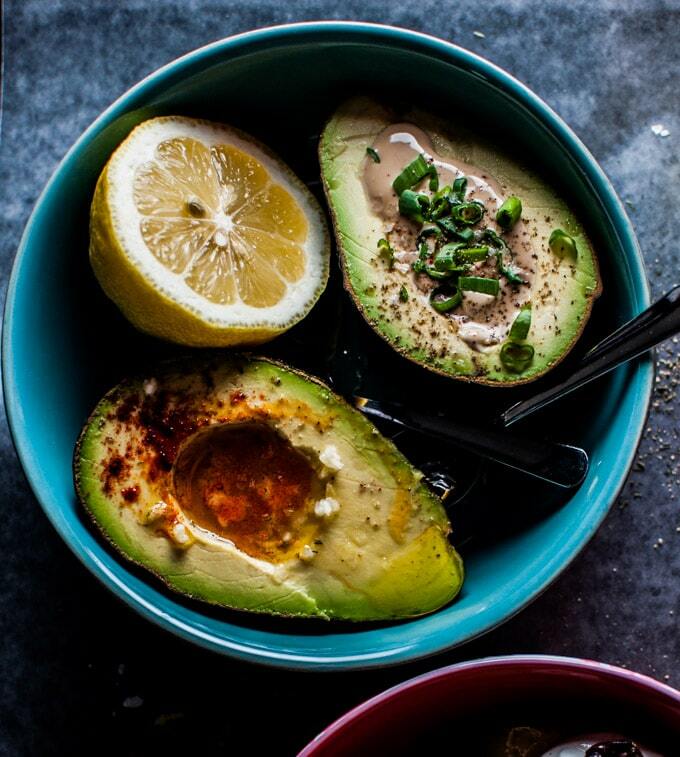 Pour vinegar into avocado half (I fill less than half the hole). Top with olive oil (approx. double the quantity of vinegar). Add salt & pepper to taste. Mix everything together except for the olives. 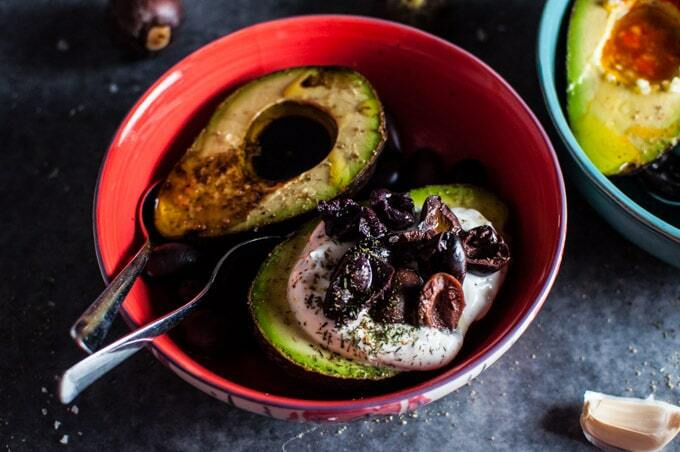 Add yogurt mixture to avocado and then top with the olives. Mix ingredients together except for spring onion and then pour into halved avocado. Top with spring onion. I never have stuffed avocados before and definitely am inspired too now – love each of the recipes, especially the dill one as it’s my favourite herb! Thank you Thalia 🙂 hope you like them. Thanks so much Erin!! ? Great idea! Love this 🙂 Avocados are one of my favourite foods so it’s great to have some options with them! Hi There. It says that the cook time is 4 minutes. But I wanted to know what it’s cooked in? Oven or microwave? Sorry it say sound like a silly question. Thank you so much! Thanks Jasmin 🙂 hope you enjoy it!